“David Blaine. 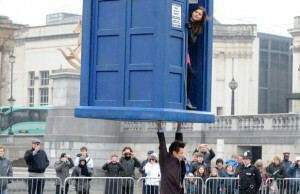 We’ll send flowers”, was the throwaway line, used as the public justification (aka coverup) for landing the TARDIS in Trafalgar Square. The line was funny. And, in a fictional prime time TV show, watched by few million people simultaneously around the planet, it was expected to be internationally funny. Rather less of an audience was watching when the heads of the UK Intelligence Agencies spoke in public; although the body language from the head of GCHQ was almost as entertaining. He certainly seemed spooked by questions he knew were coming because he’d insisted they be given to him ahead of time.